The Feb. 5 contest marked the 53rd all-time meeting between Nichols College and Roger Williams University. The Bison have won the last 13 meetings and lead the series, 32-21. Echevarria previously knocked down nine 3-pointers at Newbury on December 8, 2016. He shared the record with Billy Collins, who accomplished the feat on two occasions. Additionally, Echevarria’s previous career-high of 37 points came against Lasell on November 19, 2016 and at Endicott on January 14, 2017. The Bison have now reached the 20-win mark in six consecutive seasons. 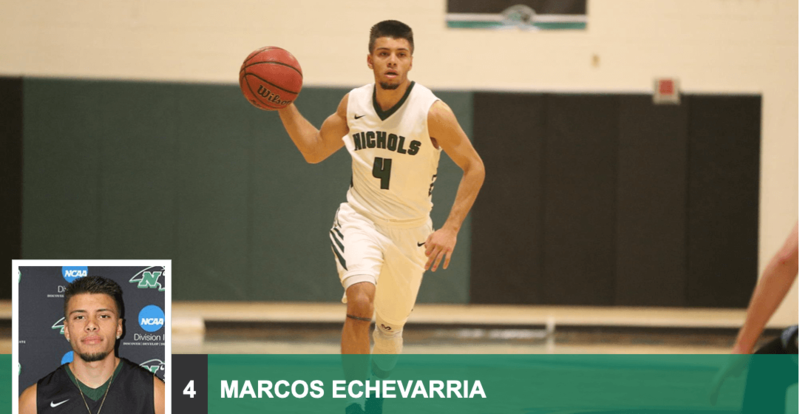 DUDLEY, Mass.—Nichols College senior Marcos Echevarria canned a school-record 11 three-pointers and finished with a career-high 38 points to help the No. 20 Nichols College men’s basketball team to a 110-77 win over Roger Williams University Tuesday night in Commonwealth Coast Conference action at the Nichols Athletic Center. The two-time CCC Player of the Year made seven of his three-pointers in the second half and finished the evening 11-of-16 from downtown (13-of-23 FG) in 33 minutes as the Bison ran their win streak to nine and moved to 20-2 on the season (12-1 CCC). Junior DeAnte Bruton added 20 points (8-of-14 FG) while sophomore Matt Morrow netted 10 points and pulled down a game-high 11 rebounds. Junior Jerome Cunningham finished the evening with nine points, eight rebounds, two blocks, and two steals. Austin Coene scored a team-high 21 points for the Hawks (11-11, 8-5 CCC) while Eli Harris chipped in with 17 points and Drew Hart tallied 11 points. Roger Williams was outrebounded 44-29 and committed 17 turnovers which the Bison turned into 19 points. Nichols trailed by one point at the half (40-39) as the Hawks shot 57 percent (17-of-30). The Bison opened the second half on a 34-16 to open up a 17-point lead (73-56) behind two 3-pointers from Echevarria and 14 points from Bruton. Echevarria then knocked down three triples in a span of 57 seconds to extend the lead to 23 points (82-59). “The guys came out strong in the second half and Marcos was almost unstoppable. We remained patient, tightened up defensively, and got the job done,” said Nichols College Men’s Basketball Head Coach Scott Faucher. Athletics, Campus Life, Slider, Students athletics, basketball, Bison, Marcos Echevarria, men's basketball, Scott Faucher, sports. permalink.